First event of the 2016 season and I wanted to do something special. So I decided to rent the new Nikon 200-500mm F5.6 and Nikon D4s. I heard a lot of good things about the 200-500mm and wanted to see for myself. It's true what everyone says. It's sharp and hard to believe it cost less than S1,500. I was warned it was heavy but I didn't find it all that heavy. Not something that you can hold all day but light enough to hold for brief bursts. The only thing I'm worried about is the lack of weather sealing. Lots of dust and being caught in the rain are my two main concerns. Besides that, this lens seems to be worth every penny that Nikon is asking for it. Now lets get to the images! The only portrait I managed to take with the 200-500mm at F5.6 and look at the sharpness. Nikon worked some magic with this lens! The extra reach helps fill the frame while the drifters are getting warmed up and adjusting to the course layout. The course layout tends to change from event to event. 200mm can be wide enough to capture tandem runs. The tight course really allows me to get up close and personal without me being in danger which is a plus. I really wanted to push the limits and dropped my shutter down. 1/60 of a second is out of my comfort zone for a big telephoto lens like the 200-500mm. The results turned out better than expected. Drivers have improved vastly over the years, tandems were one of the tougher things to capture. Drivers these days can get pretty close to each other which makes my job easier. Smooth drivers make grabbing photos so easy. The drifting version of "The Creation of Adam" painting by Michelangelo. Got to love it when the drifters just create billows of smoke as they drift by. The sun started to set and I wanted to switch things up. This is time for the D4s and 35mm to shine. I've been on the hunt for this image for years and finally got something solid for the first time. The lens flare adds a slight cinematic feel as the sun slowly begins to set. Again smooth driving makes for better photos and makes it so easy for me. 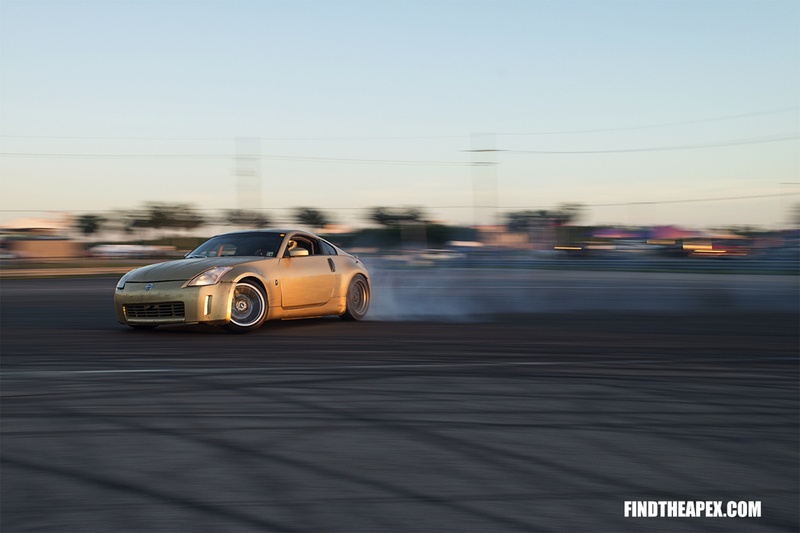 Gold 350Z during golden hour. The last and final image before packing it up. Another successful event in the books. After being away for a few events, I enjoyed my time back on the track. Didn't get to ride along this time but there is always the next event. I have some plans mix things up for future events, so stay tuned!